Craftin' Caro: Free "In Color" Texturz Assortment! Free "In Color" Texturz Assortment! 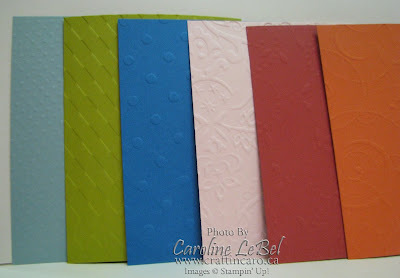 Here's a quick preview of the Texturz-embossed "In Color" quarter-sheets of cardstock that I'll be giving out FREE this weekend to all of my Open House guests. These Texturz texture plates add an embossed look and feel to thin surfaces with remarkable patterns and designs. You can use the "In Colour" sheets I'm sending you that are embossed with the Backgrounds 1 plates to create the perfect background for whatever project you're working on! Does the Chocolate Chip ink pad count? LOL! The samples look great! I don't have a bigshot....wondering if they will work using a cuttlebug? Um..how did you get your plates so fast?? ?